I love chips. I mean… I really, really love chips. Not potato chips for some reason. With me, it’s all about the tortilla chips or some variation thereof. 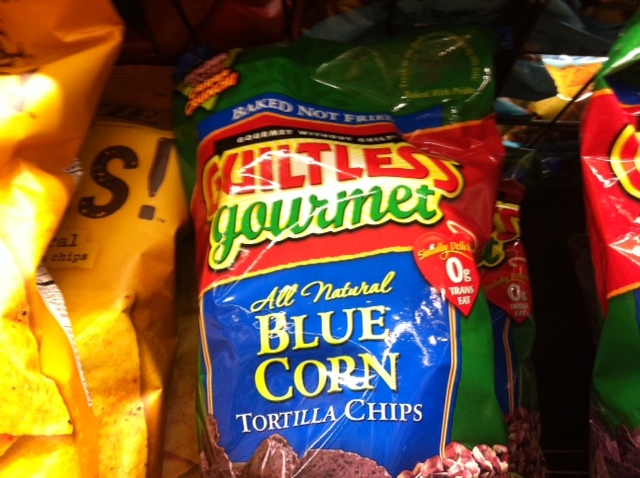 But, I’ve noticed a trend in some of the more “gourmet” and natural/organic chips. It’s an ingredient that seems somewhat curious to me. No, not flax. I get the benefit of that. Now, granted, it’s not processed sugar, which, I suppose, is at least a plus. It’s evaporated cane juice. I’ll give you that it’s not as ‘bad’ as sugar-sugar, and it’s not a chemical like those other artificial sweeteners. And, it can at least claim to have slightly more nutrients given that it doesn’t go through the same degree of processing as regular sugar does. But it still comes from sugar cane. The pros and cons, like anything else, depend on who you ask. Some say if you’re going to reach for something sweet, evaporated cane juice is the way to go. Calorically speaking, it’s the same as processed sugar. But, if you’re like me and don’t worry as much about the calories as you do the impact on your body, your blood sugar and your insulin production, you have to look at the glycemic index. Evaporated cane juice has a GI of 55, which is considered on the low side. That’s a plus. That means it probably won’t make your blood sugar go all haywire and set you off on a roller coaster of sugar highs and lows, which is great for people who watch their sugar intake. I still contend, though. Is it really necessary? My body is so sensitive to this stuff that I know if I eat something with any type of sugar, be it honey, agave or evaporated cane juice, there’s a risk of a strange reaction. And, do we really need it in chips? I ask you… why mess with that??? I’ve put together a list of some of my faves that DO NOT HAVE EVAPORATED CANE JUICE. I hope you enjoy these as much as I do – although I would recommend reminding yourself that a bag is not intended to be a single serving. Sometimes I forget!! It never ceases to amaze me that it doesn’t matter how often you practice and how many times you do the same basic postures, there’s always something new to learn and experience. Today’s “wow” moment came while doing something as ‘simple’ as suryanamaskara B (warrior 2). How many times do we do this posture in a practice, especially in Ashtanga, and just bring the foot to meet our hands then rise up without giving those movements much thought? There’s a tendency to just swing the leg forward in a haphazard way, then lift the upper body, with the focus generally being on the breath, or making sure the knee is over the ankle and the leg bent to 90 degrees, or lifting the chest, or feeling the stretch in the pelvis. – As you bring the right foot forward, keep the hands pressed firmly into the earth with the finger pads gripping the mat, ground the left foot and consciously place the right foot down near the hands, making sure all four corners of the foot make contact with the mat. – Then, as you inhale, lift your hand off the mat and bring your shoulders in line with your hips, think about really grounding the right foot. pressing the earth away as you lift your body up, reaching the crown of your head toward the sky. – Reach your heart forward while bringing the shoulder blades down the back in the space behind your heart. – Keep the energy in your arms as your bring your hands together and gaze up past your thumbs. For me, the posture suddenly became completely different. Warrior is a strong posture and by following these suggestions, it goes from just a posture that feels strong in your front quadricep to a posture in which the whole body feels strong, grounded and energized. It’s also interesting to think about how many things we do on a daily basis that we just go through the motions, treating life as mundane and activities as routine. Instead, with a little more awareness, you might see things you never saw before and feel more alert, stronger and more energized – like a warrior. FOOD FOR LIFE Brown Rice Tortillas – A treat any time of day! I try to avoid gluten. I try to avoid wheat. But more than anything, I try to avoid sugar and dairy. This last requirement is what makes finding breads and wraps a bit of a challenge. 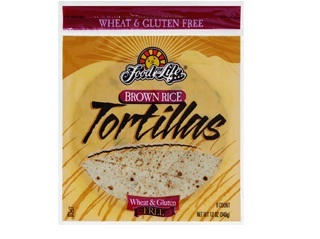 Then I found Food For Life Brown Rice Tortillas. They’re mostly known for their sprouted grain breads like Ezekiel bread. And while I like the Ezekiel bread, the wheat in it doesn’t necessarily like me. That’s where the brown rice tortillas come in. INGREDIENTS: Whole Grain Brown Rice Flour, Filtered Water, Tapioca Flour, Safflower Oil, Rice Bran, Vegetable Gum (xanthan, cellulouse), Sea Salt. They’re not bad straight out of the fridge, but I personally prefer to warm them up . I just pop them in the toaster oven on about 300 degrees for a few minutes. When I’m after something quick and satisfying that I can eat while I”m running around getting ready to go out or take to work with me, I take one out of the freezer, break it in half and stick it in the toaster oven for a few minutes on each side til it just starts getting crispy. Top it with almond butter and it’s an instant crunchy and healthy breakfast. 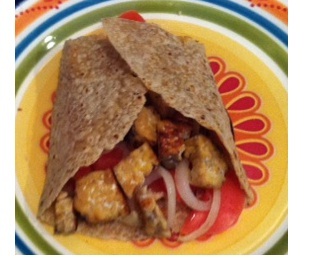 One of my favorite “sandwiches” uses the brown rice tortillas, hummus, tomato and tempeh. Something about the flavor combination is sooo wonderful. There’s a bit of a spiciness to the wrap, the nutiness of the tempeh, the garlicy goodness of the hummus and the cool tomato. Again, I stick them in the oven just to warm them up a little. Be careful, they get crispy quickly! Slather them with any flavor hummus, chopped tomatoes and tempeh that’s been sauteeed. I’ve also had them at a restaurant where they make the wrap, roll it up, then put it on a flat top so it gets crispy and warm with the fillings inside. Amazing that way too! These wraps are awesome as a crust for pizza! I’ve topped them with roasted veggies, just a little tomato and Portobello mushrooms, onions and artichokes. Anything goes! I just spray on a little olive oil from a mister, usually sprinkle a bit of garlic powder then the toppings and again pop it in the oven for a few minutes. What I love about these things is that there are no rules! Leave them til they reach the desired degree of crispiness and you’re good to go. I’m a bit of a guacamole freak and I’m always looking for something remotely healthy to eat with my guac. That’s where these tortillas are a match made in heaven. As I keep saying, they crisps up perfectly to use as chips. There’s a bit of a spiciness to them that are a great compliment to the coolness of the avocado. So, leave those fried and processed chips in the bag and make your own with brown rice tortillas! Yes, these fabulous multi-use flat delights are great for dessert too! Seriously! When’s the last time you found a food that was this multi-functional? If you’re looking for a great gluten and wheat free wrap, I highly recommend running out to pick these up. Most places keep them in the freezer, but at Whole Foods I’ve seen them in the refridgerated section with the hummus (hint, hint). And, even better, unlike a lot of the healthier breads out there, these are very reasonably priced. Let’s face it, much as we would like to have a crystal ball, when we step on the mat, we never know how the practice is going to go. Will I be able to balance in Uttitha Hasta Padanghustasana? Will today be the day I balance for a just a few seconds in a handstand? Will my head reach the mat in prasarita padotanasana? The ego in us likes to think we know. After all, we can look back at previous practices, weigh the way our bodies feel and think we have the ability to predict if it’s going to be a strong, solid practice or a challenging one with lots of lessons to teach. The operative word in that sentence is EGO. Truth is, we can no more predict how our practice will go each day as we can the next day’s lottery numbers. You know what else we can’t predict? Anything about the future – and especially as it pertains to other people and how they’re going to behave in any given situation. We – and by we, I mean our Egos – think we can. But, we can’t. Each day we step on the mat and we take the practice for what it is – good or bad. We’re present in the moment. We’re taught not to beat ourselves up, not to worry about the past and not to worry about the future. In yoga, we ground ourselves, lengthen our bodies, take a deep breath and open ourselves to the possibilities of that moment – for better or for worse. We simply accept what is. We practice this on the mat with the intention of carrying that attitude with us throughout our lives. Why then, do we let our egos get in the way and make us think we know how a situation is going to go or how another person is going to behave? I do this all the time to myself. I cancel plans because I think I know how the situation is going to play out, when, in reality, I have no idea. That’s just my ego that thinks it has a clue. No doubt, I’ve missed out on what could have been some really good times because I let myself believe I knew what other people were going to say and what they were going to do. The trick is this: when our minds start to play the “he’ll say, then she’ll say, then I’ll say, then he’ll do this, then I’ll do this” game, is to stop, to take a deep breath, to trust in the moment the same way we trust in ourselves in our practice. Take a deep breath, stand tall and to be open to the possibilities the same way we have to trust that when we lift our legs over our heads, that we won’t go toppling over… and if we do, we smile, get up, and do it again. After all, each stumble reminds us that we may lose our balance, but eventually we’ll find it again. I get some crazy cravings. It’s not so much the foods themselves are crazy, just the combinations that I want. Today I wanted an Israeli salad with falafal. That was the easy part. I could have easily found that at one of a few restaurants near my house. But, the challeng was, I was also totally jonesing for artichokes and I have no idea why! Add to that, after my less than stellar diet the past few days, I figured fried food was not the best idea. So, what’s a girl to do? What I normally do… create my own concoction! First up, the artichokes. Open the can, slice ’em in half. Place them in a pan with a little EVOO that had been heating up. Let them cook until they browned a little. Flip them over and let the other side brown slightly too. Next, the chickpeas. 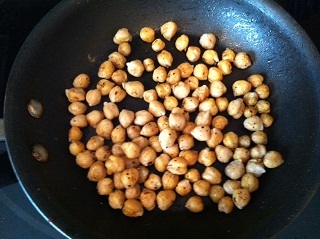 A little more hot EVOO and toss in the garbanzo beans. I added a bit of salt and garlic powder. Stir them around a little and when they start to brown, they’re done too. Meantime, shave some slices of cabbage, halve the grape tomatoes and chop up some herbs. I used basil and parsley. Into the bowl went the cold ingredients along with a drizzle of EVOO, the juice of a lemon and some salt and pepper. 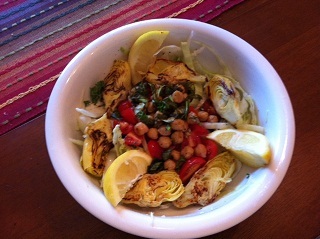 Top the salad off with the artichokes and chickpeas and dinner is served! Quick, easy, tasty and healthy! not to mention, lots of leftovers, less money than a restaurant and exactly what I was craving without driving the people at the restaurant crazy. It used to be there was just milk. Now there are tons of non-dairy options: soy milk, almond milk, rice milk, hemp milk, coconut milk. Unless you’re super motivated, you probably don’t want to make your own. I tried making my own almond milk once, and, let’s just say it was minimal return on investment. Since then, I stick to the milk on the store shelves. But when it comes to food on the shelves, I like to scrutinize labels. Most of the time, if there are any preservatives or artificial sweeteners and even stabilizers it’s probably not going in my shopping cart. Then there’s milk… specifically almond milk and soy milk. First, you have to figure if someone is drinking almond or soy milk they’re either health conscious or can’t tolerate cow’s milk. Either way, that’s a group of consumers who are conscious about what they’re putting into their bodies and they probably don’t want a lot of artificial type stuff. First, unless it’s unsweetened, most of the milks have evaporated cane juice as one of the top ingredients. In the grand scheme of sweeteners, cane juice is not terrible. It’s not artificial and it’s not heavily processed, but it is still sugar. The ingredient, though, that’s just been brought to my attention that is raising eyebrows and I would venture to say most people aren’t familiar with is carrageenan. Carrageenan is natural and it’s vegan. It’s made from seaweed and it’s used to thicken and emulisify products. But natural does not equal healthy. A study came out about 11 years ago that found carrageenan can cause ulcers and cancers of the digestive tract. Long before that study even came out, the FDA had cause to be concerned. For a short time, they put a limitation on the type of carrageenan that could be used in foods. For som reason, though, they withdrew that ruling and haven’t done anything in more than 30 years. It could be that most of the early studies focuses on the degraded form, and they type used in most foods is undegraded. According to Dr. Joanne Tobacman, from the University of Illinois at Chicago School of Medicine, there’s a chance stomach acids could work on the undegraded form and turn it into its more dangerous cousin. Dr. Tobacman did a study that was published in the Journal of Nutrition a few years ago that found even low concentrations of carrageenan was enough to induce cancerous changes in cells of the intestine. Now, to be fair, that study was done in a lab and from what I have found, there’s not a lot of proof that it really does cause cancer in humans. While the jury may be out on whether carrageenan causes cancer, what does concern me is the potential for it to cause stomach upset. Someone I know who follows a very specific diet for her child with autism was the one who actually brought this to my attention because she was told to avoid giving her son foods with carrageenan because of what it will do to his stomach. I know, for me, I notice a discomfort in my stomch when I drink milks with carrageenan but I always blamed the other parts of the drink, i.e. the protein powder or the coffee – or I just figured I couldn’t handle the almond or soy milk. It makes sense, though. Carrageenan is a thick gel. It can stick to the walls of the intestine and, therefore, can cause upset. Even WebMD warns about the way carrageenan can interact with oral medications and decrease the amount of medication absorbed by the body because of what it does inside the intestine. 365 (WF’s brand) – tasted it and really like it! It’s still a little early to tell if the carrageenan-free milks are having less impact on my stomach, but for now, I’m going to stick with those options and see how it goes. I figure, it can’t hurt! I scrutinize ingredient lists. I check for any kinds of preservatives or anything that might indicate meat or some other product that I know my body is likely to reject, and that includes sweeteners like honey and agave. But, I can honestly say, I never stopped to think about what’s in my beer. Yes, I drink beer. And I drink wine. I know, they don’t fall in the category of healthy necessarily, but sometimes you just gotta have a cocktail. Then, I came across Barnivore and this piece of information: When filtering the drinks prior to bottling, companies can use things like isinglass (from fish bladder,) gelatin, egg whites, and sea shells, among other things. These products grab onto the impurities and make it easier to catch them in the filters, though there are many animal-free alternatives in use. Barnivore offers a Vegan Alcohol Directory where you can search your libation of choice and see if there are animal products in it. I am happy to report, my favs are all on the safe list. Are yours? Check out the Barnivore directory to find out!